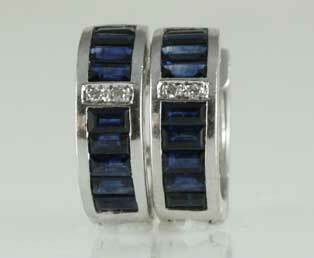 These lovely vintage blue sapphire diamond earrings are designed in a small hoop. Eighteen horizontally mounted blue sapphires follow the curve of the loop to create beautiful and comfortable earrings. Small white diamonds create an attractive center point bar design. The back of these loops have a pretty openwork design. These pierced blue sapphire earrings are made in 18kt(750) white gold.